1.Build a small garden with them. Dedicate a small area in the garden for the kids. Plant flowers, herbs, lettuce — anything that grows quickly and gives them the satisfaction of having produced something. 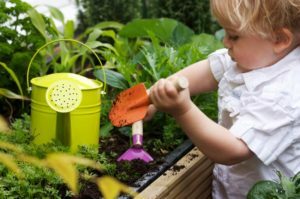 Teach them the skills of gardening in the easiest way possible. 2. Build an indoor tent : Create an tent indoors or outdoors with blankets and sheets. Once the tent is up, give them a torch and something to eat to take with them. 3.Help them creating a scrapbook . Encourage the little ones to keep a small scrapbook. They can take photos of special days and write about them. This will enhance their creativity as well. Ask them to decorate it with small buttons, dry flowers, small fabrics/laces. 4. 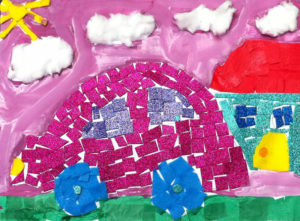 Let them Paint : One of the easiest ways to express creativity is to paint. Get large sheets of paper and lots of paint. To avoid any mess, prepare the area well and cover with plastic or newspaper. 5. Play some sport : Most local sports clubs have loads of opportunities to learn new sports, from martial arts to badminton, football to trampolining, swimming to tennis.Or you can play with them at home also at your backyard. 6. Learn origami : The ancient Japanese art of paper-folding easy to do and doesn’t cost you a lot. You can fold a sheet of paper into pretty much anything, as long as you’ve got a pattern. Give your kids freedom to play with patterns and styles. 7. Collage : You can help them create a collage poster about some great thought or an idea. Give them a large sheet of paper , colorful cutouts, glue and some colored pencils.